Skillet Turkey a la King is an easy one pot meal that is perfect for using up your Thanksgiving turkey leftovers. Serve it over buttermilk biscuits or puff pastry shells to make your family dinner extra special for your kids. It’s also a simple recipe that you can triple with ease when you are planning to cook for a crowd at your next party. 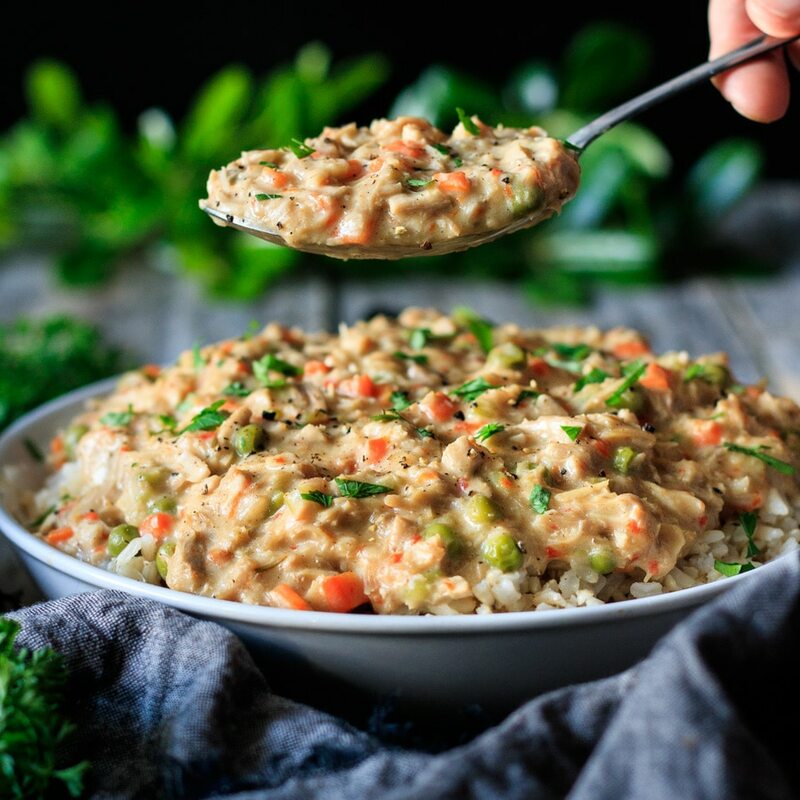 Skillet turkey a la king is a popular comfort food that combines soft, creamy textures with salty, savory flavors. 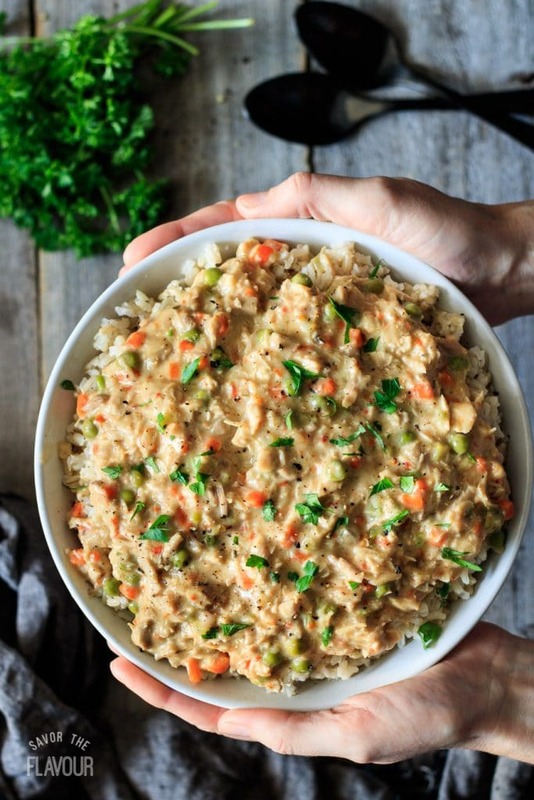 When you have a lot of roasted turkey leftovers, a la king is one recipe you’ll want to have on your menu for supper. 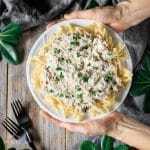 It ranks up there with with the other great turkey comfort foods like stroganoff, turkey soup, pot pies, and tetrazzini. This recipe is so versatile because you can serve it over a variety of carbs like rice, egg noddles, buttermilk biscuits, or toast points. Some creative chefs serve it over mashed cauliflower, crepes, or waffles. You can also take your presentation up a few notches by serving the filling as a vol au vent or baked puff pastry shell. This step elevates this typically humble recipe to an impressive appetizer which is sure to impress your guests. Besides turkey, the other key ingredients are usually mushrooms and peas. Since my Artistic Alex 🎨🖌 doesn’t like mushrooms, I decided to keep them out this time, but feel free to add them if you are a mushroom fan. To add flavor, aroma and depth to this dish, I added lots of aromatics, spices, and vegetables into the roux. 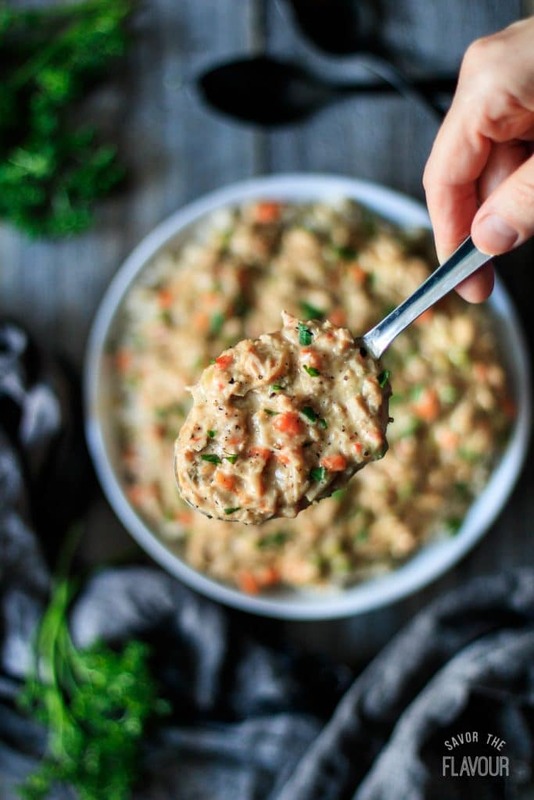 Garnish this creamy sauce with chopped parsley and serve it over your favorite carb or buttermilk whipped potatoes. Turkey and mashed potatoes always go well together. 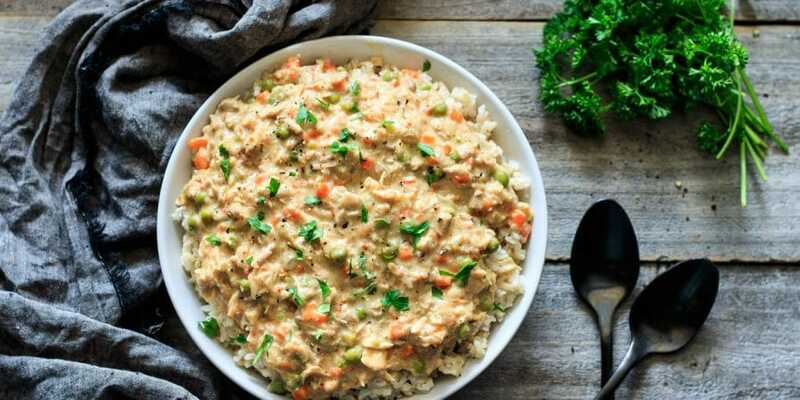 Secret Ingredient Turkey Stroganoff: use up your turkey leftovers with this flavorful secret ingredient stroganoff! 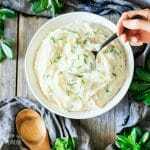 Best Sour Cream Mashed Potatoes: smooth, creamy, and a little tangy–these mashed potatoes are the ultimate side dish. How to Cook a Turkey: learn how to cook a perfect turkey for the holidays! Leave a recipe rating below if you enjoyed this turkey a la king recipe. Start by prepping the ingredients. Shred the turkey, mince the garlic, and dice the carrots, celery, onion, and roasted red pepper. In a large skillet, add 2 tablespoons of butter, carrots, celery, and onions. Stir and cook over medium high heat until soft. Add the garlic, stir, and cook for two minutes. Add the three spices and stir. Lower the heat to medium, then add 3-4 tablespoons of flour. Whisk until the flour seems cooked, about 3 minutes. Whisk in the chicken stock first, and then the whole milk. Increase the temperature a little and let the milk heat up to a boil. Stir for a couple of minutes or until it has thickened. Add the diced roasted red peppers, shredded turkey, frozen peas, salt, and white pepper to taste. Stir and cook until heated through. Serve over cooked brown rice or the carb of your choice with chopped parsley as a garnish. To add variety, change what you serve it over. Some popular suggestions are rice, egg noodles, buttermilk biscuits, toast points, mashed potatoes, and puff pastry shells. Some more unique suggestions are a corn bread wedge, waffles, crepes, mashed cauliflower, toast cups, and flat bread. Another way to add variety is to change the meat. The turkey can be switched to chicken, ham, minced clams, or shucked oysters. If you love family pies, use the a la king filling for a family pie with or without pastry on the bottom.